If you know me even superficially, you are probably aware that I like trains. A lot. Ever since arriving in São Luís, I have been fascinated by old pictures of the train and trolley lines that used to crisscross the city. As I walk the streets of the old part of town, I occasionally see the old railways peeking up through the asphalt that now covers them. I have never quite forgiven the city fathers for removing the trolleys back in the ’60s. 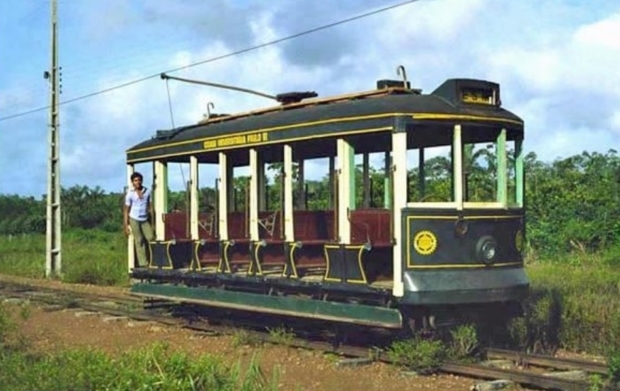 Imagine my delight, therefore, when I came across this site, dedicated to historical tram and trolley lines all over Latin America. I scrolled down through, and, lo-and-behold, there was a whole section on São Luís. It includes tons of photos (some of which I “pinned” and am including here), extensive commentary, and even maps! There is even a video, which I am also including here. The author of the site actually visited São Luís back in the ’80s, when the memory of the trams was still fresh, and when one of them was still operating on the campus of the state university. Enjoy the pictures, but definitely take the time to check out the site as well. One of the tram cars, newly delivered from the factory in Philadelphia. The original trams were drawn by animals. This tram went right in front of the governor’s mansion, the Palace of Lions. A couple of the passenger trains that serviced São Luís back in the day. The original tram station. I don’t believe any trace of it still exists. Trolley cars at the João Lisboa stop. Traces of the tracks can still be seen here. Another train, this one a cargo line, in São Luís. Color image of one of the tram lines. Another one from the Praça João Lisboa. Arriving at the Praça João Lisboa from the Rua da Paz. What remained of the tram station (and a couple of the trams) at the time of the author’s visit. One of the trams that still ran at the state university (UEMA) at the time of the author’s visit. Another tram, not in use, that was at the university. A video taken by the author of the site of the tram in use at the university. There is much more to be seen at the original site…please take a look!